We are an independent church, and are historically affiliated with the Southern Baptist Convention. We subscribe to the 1689 Baptist Confession, biblical reformation and church discipline. We are a Bible-based, Christ-Centered, mission-focused, and maturity-focused church, being disciples and making disciples of Jesus for the glory of God! Welcome to all of you for your visiting our church here in Siem Reap, Ministry and help us with our God worked. Grace to you and peace from God our Father and the Lord Jesus Christ. Gateway baptist Church is located south of Vancouver and about two hours drive to Seattle. We are in a community that is less than 5% Christian. We are committed to preaching the whole counsel of God for the glory of God, the salvation of sinners, and the edification of the saints. We are an evangelistic community minded church that holds to the reformation. This church is the result of a desire to establish a church in the greater Saint John, NB area that teaches the doctrines of Grace. Our solid foundation is Sola Scriptura. That is why we invite you to come to church and to bring your Bible and your mind! Church confession: We have our own doctrinal statement. At our founding we have been committed to Reformed Baptist principles, based upon Scripture and the 1689. Covenant Baptist Church is a Reformed Baptist Church in Toronto,Canada. We are committed to expository preaching, discipleship and evangelism in one of the most multicultural cities in the world. 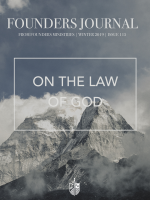 We consider ourselves as a Reformed Church, and we agree with the teachings of biblical reformation, and we thank God for the great job you are doing at the Founder´s Journal. My Church have or follow de London Baptist Confesion of 1689. We are a church that defend the Five points of calvinism, and all the Reformed Tradition. Is in spanish language. Many Thanks. Small group of international English-speaking believers committed to the Word of God and doctrines of grace. Bo Barandillas 11 Calle Entre 7 Y 8 Ave N.E. We are conducting Education,Health,community development and spiritual programmes in all places with our own efforts.please pray for our Rural Care Ministries. It can be associated with baptist churches and welcomes all sort of support to carry on the mission in India. Our church is a Baptist Church which strongly follows the fundamentals of the Bible. Founded 1988. Has been a reforming church throughout it's life, holding to the 1689 (2nd Londodn) Confession. Confessionally 1689, with ongong reformation in practice. Puchong Grace Church is fundamentally a local church. We are but a small part of the Church that Jesus promised to build and establish for His glory and for His name’s sake (Matthew 16:18). Bible Baptist Church is an Evangelical Baptist Church which preaches the whole council of God. Our aim is to win people to the Lord Jesus Christ and giving glory to Almighty God. Parque Diriamba, Claro, 2 1/2 Cuadras Abajo Maranatha. Sutlej Reformed Church is an active, Biblical, Christian, Confessional, Conservative, Missional, Protestant, Presbyterian, Passionate, Radical, Reformed and Zealous denomination in Pakistan. SOVEREIGN GRACE BAPTIST CHURCH AND INT'L MINISTRIES, INC. The Sovereign Grace doctrine is a transformed doctrine of Heaven that we received from God. We preach them boldly, teach them bravely and we are ready to die for it. We can do all things through Him. Conservative Baptist Church that adheres firmly to the 5 Solas, the Doctrines of Grace as explained by John Calvin, and the Fundamentals of the Faith. The church upholds the 1689 Baptist Confession of Faith. Constitutionally the church subscribes to the 1689 confession, as does African Pastors Conferences (APC) which is accountable to the church. As the Word of God is preached, believers multiply and as disciples are made it builds the body of Christ and as disciples multiply the church is empowered and it becomes reformed. Various Meetings In Houses. Contact Us For Information. We would wholeheartedly concur that the Reformers embraced the biblical Gospel of Jesus as opposed to the false gospel of the Catholic Church, and welcome fellowship with anyone so professing. A reformed baptist church practicing reverent worship and proclaiming the doctrines of grace.